Today's bitterly cold temperatures conclude a week characterized by gusty winds and our first significant snowfall of the year. Despite the blustery weather, the legislature made significant progress, passing numerous bills and making headway on the budget. There are no snow days during the General Assembly session, and we are well on our way to adjourning by the end of the month. Following are updates on several legislative initiatives. Last year's acrimonious General Assembly session culminated in a standoff between proponents and opponents of Obamacare's Medicaid expansion. My Republican House colleagues and I remain steadfast in our opposition, and I am pleased to report that the House budget contains no provision for expansion. While I recognize that improvements in the healthcare system need to occur, I believe they must be pursued at the state level, not via expansion of a federal entitlement program. To that end, the House budget doubles funding for free clinics. Additionally, the House budget funds initiatives to offer care for people with serious mental illness. These improvements will provide behavioral health services, including prescription drug coverage, to an additional 29,000 Virginians suffering from mental illness. Transparency in government is essential, and I am pleased that the House now requires the budget be posted online at least forty-eight hours prior to our vote. This policy will allow Virginians to review the budget and share their feedback in advance of the final vote. As a legislator, I also appreciate the extra time to conduct research. To view components of the budget online, click HERE. This figure represents Virginia's January 2015 ranking by the National Alliance of Public Charter Schools. Out of the forty-three states with provisions for charter schools, Virginia ranks number forty. These poor marks reflect the Alliance's note that "Virginia's law needs improvement across the board." During this year's session, we made significant progress in changing Virginia's inadequate charter school policies. Last week, the House and Senate passed identical resolutions making it easier to establish charter schools in Virginia. If the same resolutions pass again during the 2016 General Assembly session and are then approved by voters, charter school policies will be enshrined in Virginia's constitution. I strongly support charter schools, a position shared by unusual allies: the media. In a February 16 editorial titled "Consider every idea" the Daily Press excoriated Democrats, noting that "Teachers unions and other in the education lobby exert powerful influence over the Democratic Party, and politicians are keenly aware of who butters their bread, so to speak." "Considering the problems in Virginia's most troubled, failing public schools, we should be willing to reasonably consider any idea with the possibility of success. We applaud those local lawmakers who stood up for charter schools and expect area detractors to account for their opposition." In a previous newsletter, I shared information about House Bill 1626, Delegate Rob Bell's legislation allowing home educated students to participate in high school sports. Believe it or not, this bill was first introduced twenty years ago in Virginia. At long last, however, the legislation passed the House and Senate. The bill is now headed to Governor McAuliffe for his signature. Please call the Governor at 804-786-2211 and as him to sign House Bill 1626! If you have not already done so, please take a minute to view the results of my 2015 Legislative Survey. Thank you again to all who completed this year's survey. I truly appreciate your input. In my Week 3 Newsletter, I highlighted House Bill 1488, legislation allowing parties in a conservation easement to participate in a dispute mediation process overseen by the Virginia Land Conservation Foundation. This straightforward bill brings accountability to the land conservation program and earned strong support from my General Assembly colleagues. Earlier this week, the bill passed the Senate on a vote of 32-6. The bill will now be sent to Governor McAuliffe for his signature. The week brought a flurry of media coverage regarding my resolution encouraging support for Israel. During the vote for HJ 659, House Democrats walked off the floor rather than vote on the resolution. Their actions caught the attention and earned the scorn of The Weekly Standard, Fox News, and Townhall.com. Video of the vote has now garnered over 45,000 views. The resolution was assigned to the Senate Rules Committee, where it will be heard next week. To view the list of Senators serving on the Rules Committee, click HERE. 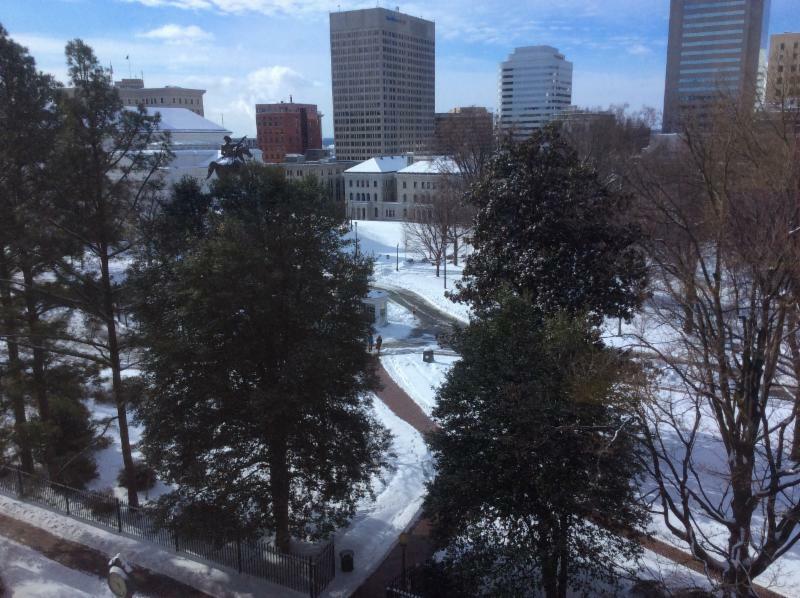 Although the wintry weather deterred many visitors, I was able to take the following picture from my General Assembly office. While I enjoy the beauty of the snow, I'm ready for the first signs of spring! Only eight days remain in this year's General Assembly session. If you plan to visit Richmond before February 28, please call 804-698-1096 or email DelBPogge@house.virginia.gov to set up a time to meet with me. Visitors are always welcome. Have a great weekend...stay warm!